Lots of great bonuses and news to pass along today! Check your email for a special offer from Club Carlson if you happen to be an Elite member in the program. 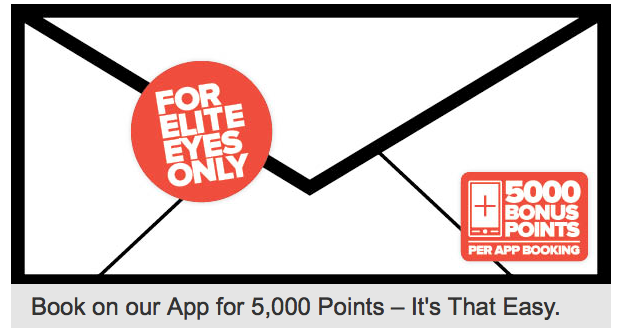 They are offering 5,000 Club Carlson points for booking via the Club Carlson app. Book by April 5th for stays anytime in April. Not really a bonus offer but an example of how SCENE is expanding their program. Members of Cineplex's programs can save 25% at Sport Chek today and tomorrow. Find out more here. As we mentioned last week, US Airways Dividend Miles is now officially gone and DM accounts should have been or will be merged into your AAdvantage account. When you go to the US Airways site, Dividend Miles is no longer as it is replaced by AAdvantage. - 1,000 Bonus Guest Miles on your first Gilt purchase of $50 or more. More... Until ?